The time between each frame is .1 seconds. Libby Lenton did not swim the 200-m freestyle individual event at the Australian Trials or the World Championships. The reason she is featured here is that this swim, the lead-off leg for Australia in the 4 x 200 m freestyle relay, was timed at 1:57.06, the fastest time in the world in 2005 and faster than Solonne Figues' time of 1:58.6 in winning the individual event at the World Championships. Libby Lenton established herself as the premier women's sprinter of 2005. Frame #1: The right hand has touched the water. The left arm is in a full-propulsion position. The left arm is moving as a unit applying its upper and lower arm and hand sections in a propulsive manner. The swimmer has excellent streamlining. The right foot is about to kick to counterbalance the backward push of the left arm. The left leg has kicked. Frame #2: The propulsive arm has adducted at the shoulder and entered its extension phase. A feature that is mentioned rarely, if ever, can be seen in this picture. That is the movement of the shoulder. At entry, the shoulder is abducted fully forward. In Frame #1, the shoulder has moved backward (downward relative to the body), and in this frame it is adducted along with the arm. That shoulder movement can contribute as much as 6-8" to a stroke. The right arm extends forward. The right foot kicks. Frame #3: The right shoulder and arm are extended fully forward. The left arm still propels the swimmer forward in this final stage of extension. The right foot kick is completed. Frame #4: The left arm has exited. The right arm begins to be repositioned. The left leg begins to kick to counterbalance the right arm action. Frame #5: The right arm presses down with the shoulder and upper arm being positioned to better apply force. The left leg kick is partly completed. The swimmer's streamline is still excellent and a feature of this swimmer's stroke. Frame #6: The right arm repositions through a classic set of movements: outward rotation of the scapula, medial rotation of the upper arm, and flexion at the elbow. The hand supinates at the wrist to the degree required to present its largest surface to produce propulsion. The swimmer lowers her head. The left leg kick is completed as it counterbalances the vertical force components created by the repositioning of the right arm. 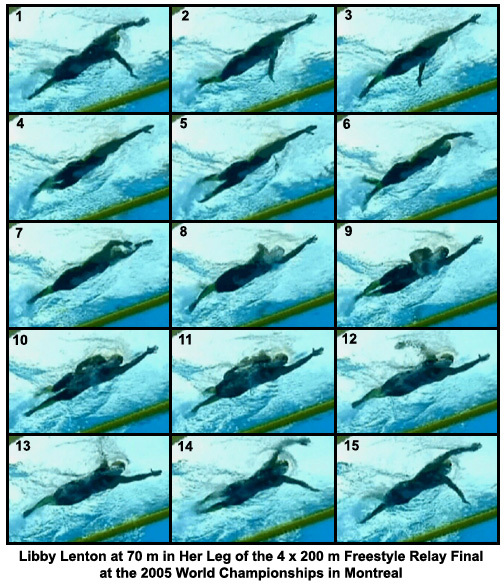 The length of time (Frames #4 - #6) that it takes the swimmer to reposition the right arm is an inertial lag, and costs this swimmer time. The right arm movements in Frames #4 and #5 should have occurred while the left arm was in its latter stage of propulsion. The timing of the arm stroke is worthy of discussion. At first glance, one might assert this is an overtaking stroke, or "front quadrant" swimming, or some such label that is supposed to increase understanding (but unfortunately has the opposite effect). There are two main reasons why the arm overlap has occurred (it does not have to be limited to only one reason). First, the initiation and completion of the right arm reposition occurred slow enough to allow a very quick ballistic recovery to occur. Second, the full extension forward of the right shoulder and arm will promote a full-length stroke. One has to realize that the longer the stroke underwater, the greater is the time it will take to complete. The longer the underwater stroke, the greater will be the difference between propulsive and recovery phase times. That difference requires the recovered arm to be parked until it is time to pull. Frame #8: The right arm is now vertical and propelling backward. The pocket of turbulence on the back of the right hand suggests this. The left arm has entered and is "parked" in front of the swimmer. This is an example of Australian distance swimming occurring in sprinting. One has to wonder if the contribution of Australian crawl stroke has been the re-emphasis on length backward as well as forward in the underwater action as opposed to the "US focus" on only length forward. The right leg has completed its kick. Here is an excellent display of the forces created by the kick in this swimmer. Some coaches still advocate that the kick is propulsive. If that were so, the drag pockets produced by the swimmer would be positioned forward of the foot/lower-leg. However, as can be seen here, the pocket of turbulence is above the foot and lower leg. The forces created by that kick were mainly vertical. Any horizontal component would have been inconsequential. Frame #9: The right arm continues its propulsion. It is moving as a unit and has just entered the stage of adduction of the upper arm. The turbulence pocket can be seen clearly on the back of the hand, up the lower arm, and on the lower portion of the upper arm. Of particular note is the amount of turbulence emanating from the face. It is considerable and being of that size would warrant attention to the head's movements to reduce the apparently considerable resistance it causes. Perhaps coaches should once again pay attention to what the head does in crawl stroke. The left leg prepares to kick. The left shoulder is extended fully forward. Its position next to the left ear should be compared to that displayed later in the stroke. Frame #11: The hand is the last part of the right arm to exit. The swimmer looks ahead at the outstretched left arm and increases the amount of turbulence off the face. The right leg begins to kick to counterbalance actions of the left arm. Frame #12: The left arm pushes down. Because of the viewing angle, it is not possible to describe exactly what actions occur in the left arm. [Other views in the coverage of this stroke show that the arm's sequence of movements is similar to that of the right arm.] The right arm recovers very quickly (from exit to half recovery takes .1 seconds). Frame #13: The right arm continues to press down and to be repositioned. Some of the upward vertical force from the pressing aspect counterbalances the vertical downward force created by the right arm as it begins its approach to entry. Substantial turbulence continues to stream off the swimmer's face. The right leg is dragged momentarily to assist in developing counterbalancing forces for the left arm repositioning and its vertical force component. Frame #15: The position displayed in Frame #1 is replicated. Libby Lenton displays an extremely long stroke for a sprinter. Its similarity to the distance strokes of Ian Thorpe and Grant Hackett is notable. The major feature that might be altered to better this stroke is a shortening of the time it takes to reposition each arm before propulsion after the propelling arm has exited the water. This delay might be an error in technique but also, it could be an artifact of performing six full kicks and the time it takes to complete those kicks. If kicking is a dominant feature in Libby Lenton's stroke, her ability to rate any higher will be limited by the requirement to complete full six-beat kicking cycles. Of major note in Libby Lenton's stroke, is the length of stroke in the latter phase of propulsion. This is a notable signal that it is time for coaches to re-emphasize the back half of the stroke in all swimmers and especially sprinters. It is this writer's opinion that the over-emphasis only on the front part of the stroke, when propulsion is least, has been a wrong path for intended crawl stroke improvements. One simple improvement in Libby Lenton's stroke could be her head action. Instead of looking forward, which develops resistance, the head should be held on a horizontal axis and rotated on that axis to breathe. The highly turbulence-creating facial features should be shielded from the oncoming water or at least minimized in their meeting with undisturbed water.